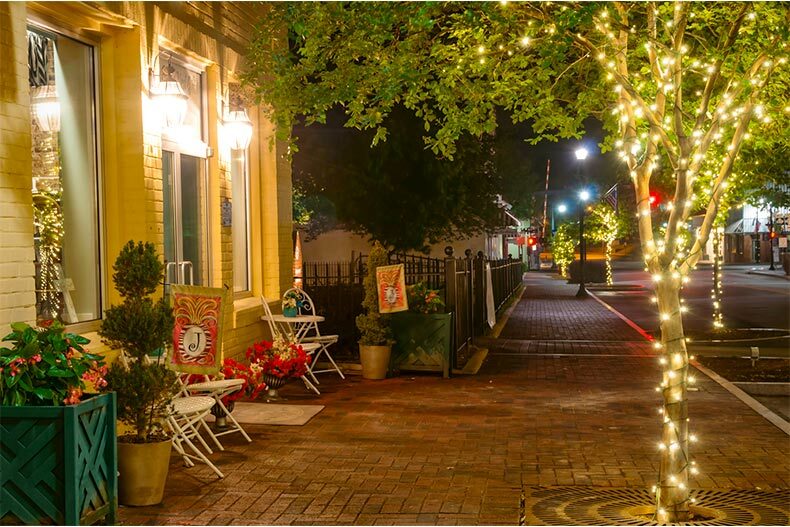 Homeowners in Imagery have access to a lake, nature trails, and quaint, downtown Mount Holly. Located a little under 30 minutes from vibrant Uptown Charlotte, the charming small town of Mount Holly, NC has recently become one of the city’s most sought-after suburbs to live. Beyond its close proximity to Charlotte and all the big city amenities it has to offer, Mount Holly also boasts the picturesque Mountain Island Lake that has 61 miles of pristine shoreline. Taking up some of that prime real estate along the shore is a new, age-restricted, lakefront community that will feature a little over 500 new homes once it’s completely finished. Now, active adults can secure their place in what is sure to be a popular 55+ community. Imagery offers potential homebuyers the opportunity to purchase a brand new, single-family, detached home that will be located on an expansive 293-acres of covetable lakefront property that sits along a quiet peninsula. The ranch-style homes are being built by Lennar Homes with prices starting in the high $200s and increasing to the high $500s. Houses in the community will range from 1,400 to 4,000 square feet with floor plans that can include two to four bedrooms, two to three bathrooms, and attached two-car garages. Every plan will include a master suite on the first floor with the option to add a second level to the floor plan for extra space. Choice home sites will offer homeowners exceptional views of the Mountain Island Lake. Even home sites that don’t offer waterfront views will be surrounded by serene woodland providing plenty peace and quiet. Along with the idyllic lakeside location and desirable floor plans, Imagery has a lot to offer potential residents. Notable amenities within the community include an expansive clubhouse that was designed to be the neighborhood’s hub for activities and socializing, a number of multi-purpose rooms, dog park, outdoor pool and patio, as well as craft and pottery studios where residents can take classes offered by Imagery and create their own art projects. Another perk to being an Imagery homeowner is the private beach where residents can sit back, relax, and soak up the sun on the stunning lake views. There will also be a community boat dock and ramp for residents to use, but boat owners will want to snap up one of the Imagery home sites that will feature private boat slips for easy access to the water. As far as staying fit and exercising. there’s a wealth of activities to choose from that are sure to get the heart pumping, including tennis and pickleball. For those residents who want a more serene workout, there will be several different hiking trails spread throughout the property that will vary in difficulty and skill level. Some of the trails will be designed for a casual stroll along the waterline or woods, while others will be geared toward a more strenuous trek. There will also be yoga classes offered at the community’s fitness and yoga center. Accompanying Imagery’s many impressive amenities the neighborhood is making a point to focus on creating a tight-knit community through organized social events, holiday parties, scheduled classes, and clubs. Besides Mountain Island Lake, nearby attractions in the Mount Holly area include several expansive parks and natural spaces. Including the U.S. National Whitewater Center where visitors can whitewater raft, rock climb, paddle board, zip-line, and mountain bike. Also nearby is the Daniel Stowe Botanical Garden to explore, Lake Norman, the 1,343-acre Historic Latta Plantation and Nature Preserve, and the Carolina Raptor Center. Additionally, Charlotte’s many museums and art galleries are a short drive away. Prominent museums in the Queen City include the Bechtler Museum of Modern Art, Mint Museum Uptown, Levine Museum of The New South, and Discovery Place Science Museum. For active adults who love to read and want to stay closer to home, there are two public libraries to join that are both within a short driving distance. There are a number of medical and healthcare facilities close to Imagery, including Gaston Memorial Hospital, Carolina Healthcare System’s Riverbend Family Practice, and Caromont Health’s South Point Family Practice. Plus, Charlotte’s renowned hospitals and medical specialists are only a half hour away. On the weekends there’s always something to do in town with no shortage of community gatherings scheduled throughout the entire year. Imagery residents can expect to find a wide variety of activities going on in Mount Holly, including popular farmers markets on Main Street every Saturday during the spring and summer months, as well as an array of local events, which range from concerts and movie nights to charity golf tournaments and community runs.